Cafés have long been the social, intellectual, and artistic center of Paris. Found on just about every street of the capital, these establishments have seen a reduction in patronage in recent years but many of them have a long, colorful history. At the beginning of the last century the fashionable patrons gradually switched their allegiance from Montmartre in the north to southern spots along the bustling boulevard du Montparnasse. Many of the larger cafés—Le Dôme, La Rotonde, and Le Select—are attracting crowds of locals and tourists even today. 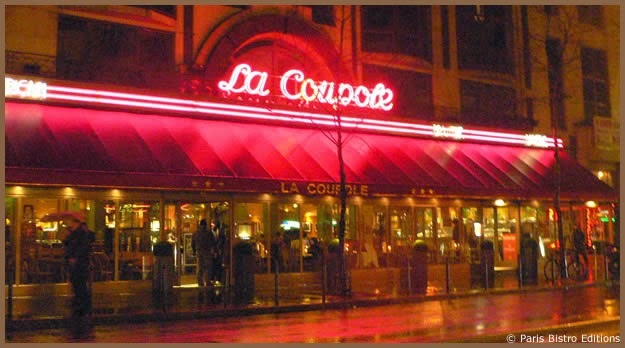 Another longtime favorite in the same area is La Coupole. The proprietors, former managers of Le Dôme, were no fools, setting up their location just down the street. When it was time to choose a name for their new 600-seat brasserie, they also picked a synonym for “dome” to attract clients. Even more clever, for the grand opening in December 1927 they invited a thousand or so people to come and enjoy free appetizers and champagne—1500 bottles of the bubbly as a matter of fact! The party was a wild success, going on till the police broke it up at 5:00 in the morning. 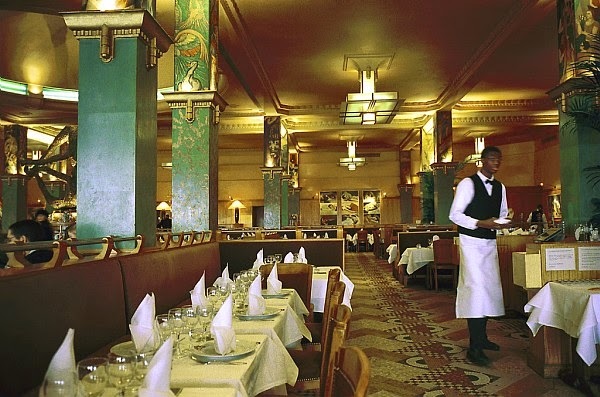 An Art Deco masterpiece, the Coupole’s sleek, rectangular interior pillars were decorated by artists of the day. One of the columns commemorates ostrich-plumed American performer Josephine Baker who dined there with her lover, mystery writer Georges Simenon. 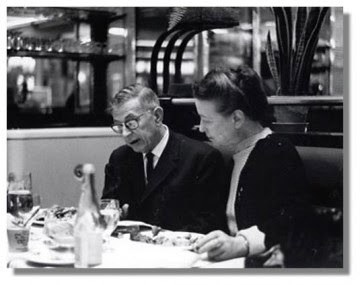 Clientele over the years included artists Picasso and Man Ray, writers Hemingway, Henry Miller, Sartre and Beauvoir (pictured), as well as The Doors lead singer Jim Morrison. Albert Camus supposedly celebrated his Nobel Prize for Literature here in 1957. 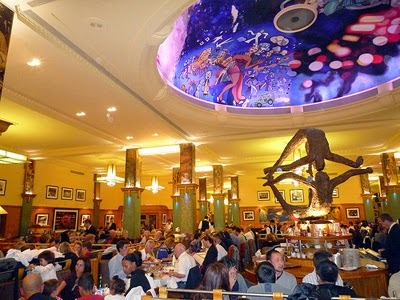 Located at 102, boulevard du Montparnasse in the 14th, La Coupole was refurbished to its original glory in 1988. Visitors can drop in from 8:30 a.m. till midnight everyday. And I plan on doing just that the next time travels bring me to Paris. Paris of the 1920s was a magnet for Americans of all stripes—some who came for a visit and others who chose the city as home. In fact, the first several years of the decade saw the number of American inhabitants rise from about 6,000 to over 30,000. Jazz Age musicians such as Sidney Bechet were charmed by the city and found appreciation for their art as well as relief from the rampant racism of their home country. 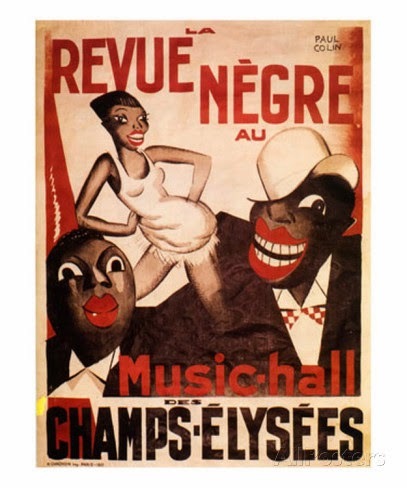 Arriving with Bechet and La Revue Nègre in 1925 was a nineteen-year-old headliner born Freda Josephine McDonald. Who could have imagined that the skinny child who grew up in poverty in St. Louis would go on to become the toast of the French capital? 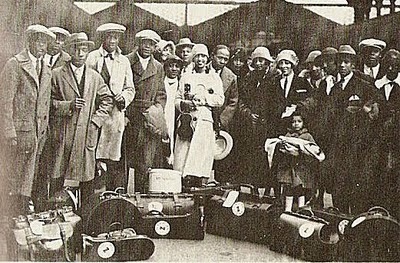 Given the French fascination with African-Americans and jazz, performances of the review were sold out from Day One. Blending sensuality and clowning around on stage, the young woman (who performed using her husband’s name) was an immediate hit. Dressed in a feathered skirt, she and her partner drove the audience wild with their Danse Sauvage. 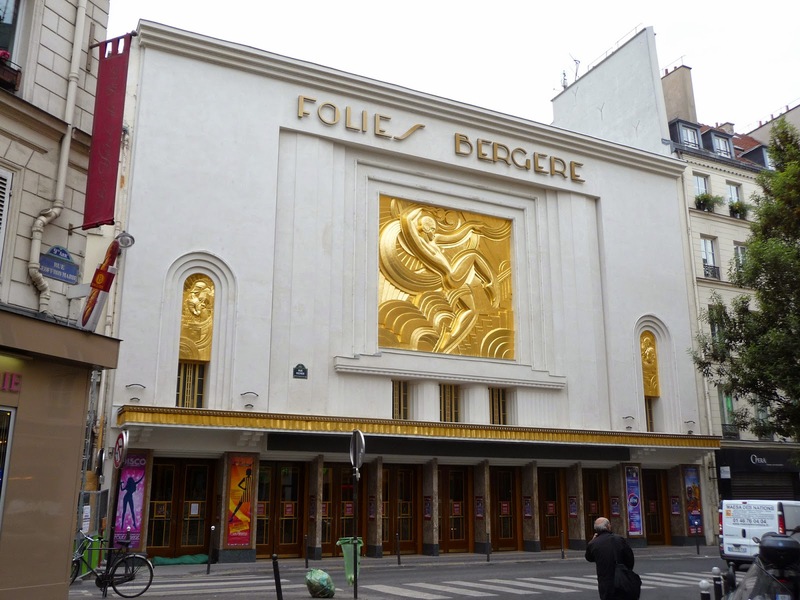 After similar success with the Revue in Berlin, Baker returned to the French capital as the artificial banana-skirted star at the Folies Bergère, the music hall now adorned with her image. Her beauty attracted hundreds of suitors, including Belgian mystery writer Georges Simenon. From the fortune she made, Baker was able to open her own club, Chez Josephine Baker, off the Boulevard de Clichy in Montmartre. But Baker was more than just another pretty face. For her help during the French Resistance during the Second World War, she received the Croix de guerre and France’s highest honor, the Légion d’honneur. A Civil Rights activist, she refused to perform for segregated audiences in this country. Financially ruined at the end of her life, Baker survived through the efforts of her friend Princess Grace of Monaco. 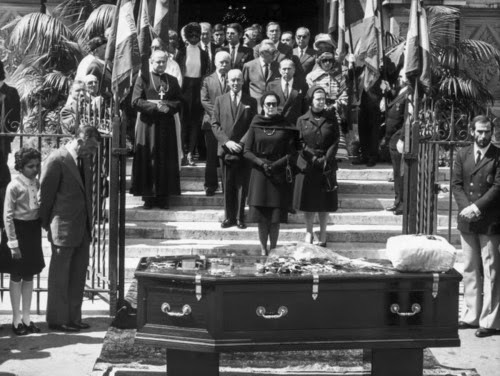 At Baker's death in 1975, she was accorded a state funeral at the Église de la Madeleine in Paris. To this day postcards and posters featuring the image of La Bakair, as the French pronounce her name, can be seen throughout the city.